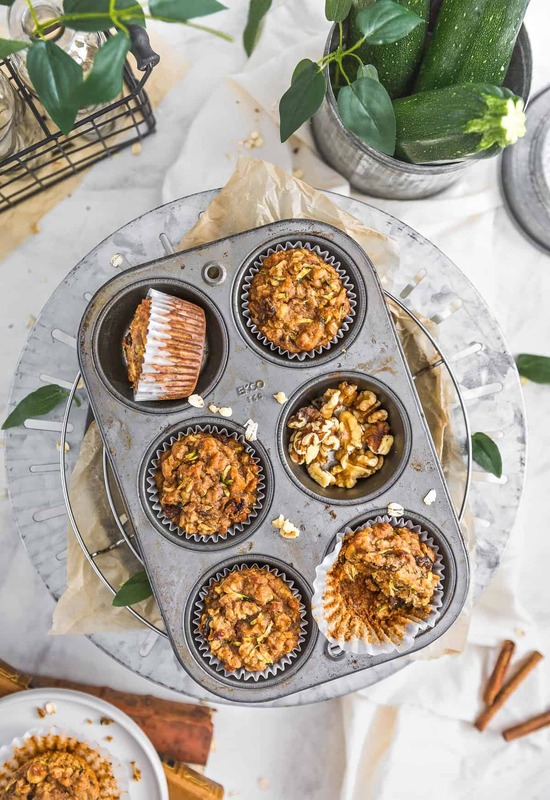 Perfectly tender with just the right amount of cinnamony goodness, these Vegan Zucchini Muffins are summer-loving in every bite. Healthy and utterly delicious, you can be assured that these beauties are packed with flavor! 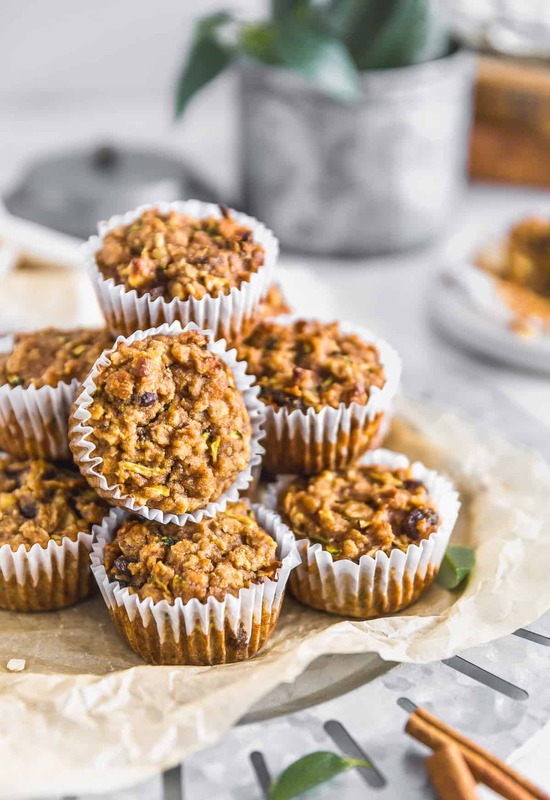 Fresh zucchini, tender oats, crunchy walnuts, and sweet raisins create a yummy treat that is sure to please. A fabulous Whole Food Plant Based recipe, vegan, oil free, refined sugar free, gluten free, no processed ingredients. Mom has been making zucchini bread for as long as I can remember. Her zucchini bread is legendary in our family; yes, her zucchini bread is THAT good! Of course, she doesn’t make it anymore since it was loaded with sugar, refined flour, eggs, etc. all things “unholy” now. I jest, I jest! Not “unholy”, just not healthy! We are a gardening family. My dad is a gardener from waaaaay back in the day. Actually, his family grew acres onions in Central NY and sold them to various farmers markets. His family also had a sizeable family garden where they grew just about anything and everything. He took that same love of gardening with him when he moved to Ohio, where he met my mom. They made sure that they bought a house with enough land to put in a sizeable garden. Dad always plants zucchini. He loves zucchini. He especially loves zucchini bread. Sometimes, I think he purposefully lets a few zucchinis grow extra big because he knows Mom will make zucchini bread with them, and boy, can she make a mean zucchini bread! Mom has this ancient hand crank fruit and vegetable grater that she has had forever. She told me it is about 50 years old. She loves this thing. It is so old that the suction cups that held it to the counter have dried out and cracked, and no longer keep the darn thing stable on the counter. It is completely unstable and rather worrisome. Even when we got the Cuisinart Food Processor with its handy-dandy grater attachment, she would still get that thing out and attempt to use it to grate zucchini and carrots. Imagine Mom trying to grate zucchini while this ancient grater is wobbling all over the kitchen counter. She was always fighting it like crazy to keep it under control. The metal “safety” shield kept flying off and often clattered across the kitchen floor as it no longer served its purpose. Finally, last year she gave up because her ancient grater just got too crazy and rather unsafe, so she finally started using the Cuisinart grater attachment and instantly fell in love with how fast and efficient it was to grate zucchini. Mom was working on our zucchini fritter recipe testing so many of those zucchinis went towards the fritters. If you haven’t tried our Buffalo Zucchini Fritters, man you have to try them. They are amaaaaazing! Poor Dad, he wanted zucchini bread so bad. He has a sweet tooth ten miles long! He enjoys nothing more than sitting down to read his newspaper in the evening with a cup of coffee and a sweet treat. Soooooo, I decided to make zucchini muffins rather than zucchini bread since I felt our success ratio would improve because we are gluten free. Gluten free baking is challenging to begin with, then add no oil, no eggs, no refined sugar, etc. to it and you know what I am talking about. This recipe took about 4 kitchen tests to perfect. 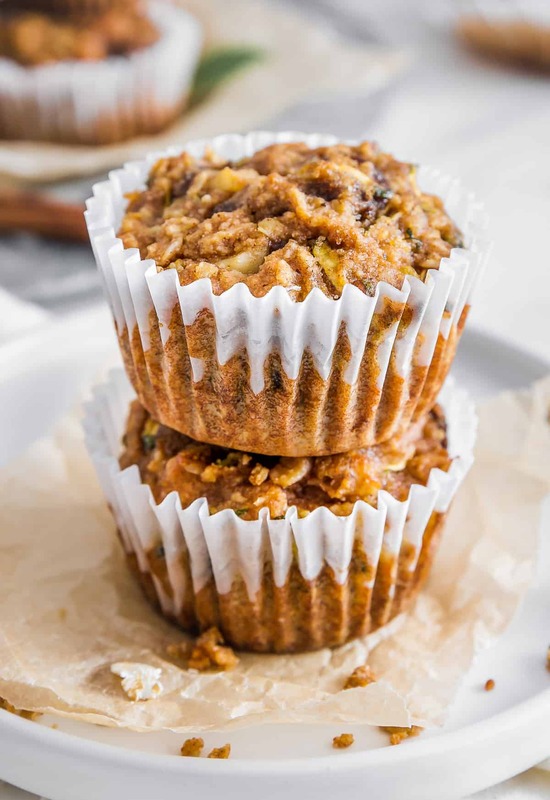 I am happy to share with you that these zucchini muffins hit all the “mains.” They are moist, tender, flavorful with perfect texture and are a tiny bit sweet. We all fell in love with them. Dad scarfed them down and has been raving about them ever since. YAY!!! I nearly peed my pants laughing at Monkey’s description of me trying to wield my ancient grater. Truth be told, that poor thing had seen its day a long time ago, but I just couldn’t bring myself to stop using it. I have had that thing for many years. I have been using it faithfully for as long as I can remember. It is like a trusted friend. It worked perfectly until things started to wear and the suction cups stared to crumble and fall apart. I love that thing. I still have it. I can’t bear to give it up or toss it out, even though it can no longer be used safely. It now sits way back on a shelf in a lower cabinet, in the far recesses – completely out of reach. Sad, that it is out of commission, but it needed to retire. Sometimes, I feel like that at work. There are days when my brain just doesn’t want to keep firing on all cylinders, but then one of the “young ones” needs my help, and I am reminded that I am not that old (59), I still got some good working years left in me! 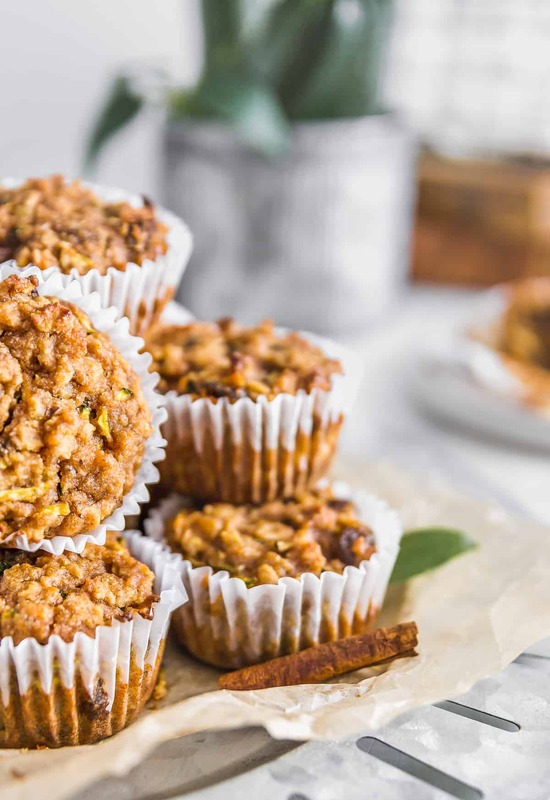 I was busy kitchen testing our Buffalo Zucchini Fritters when Monkey decided to start kitchen testing zucchini muffins – well mostly because TP109 was rather pitiful, and Monkey is a softy when it comes to her dad. She will make him anything he wants. 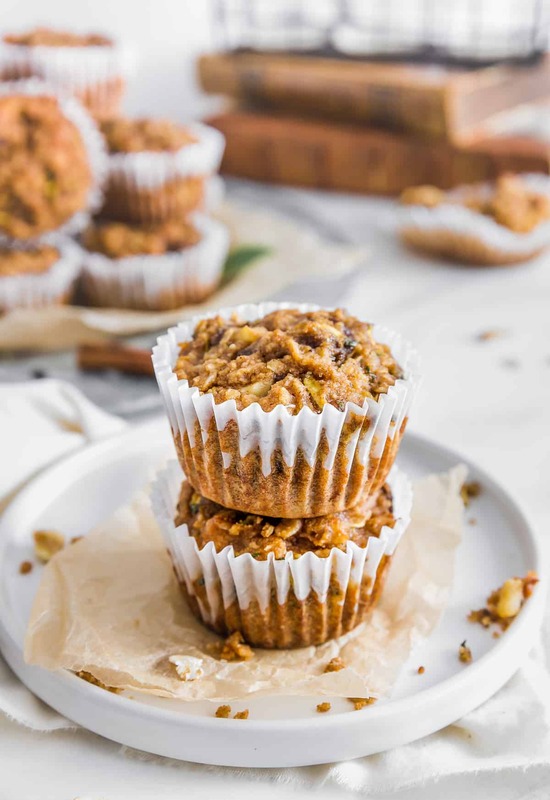 He couldn’t have been more obvious about wanting traditional zucchini bread, but Monkey wanted to show him that her zucchini “bread” (muffins) would taste just as yummy and flavorful without all the unhealthy ingredients, and she did exactly that. Her zucchini muffins are soooo gosh darn delicious. I absolutely love them. Good job Monkey!!! TP happily devoured them! He was a happy camper! We hope you give them a try and become a “happy camper” too! Preheat the oven to 350 F. Place the oven racks towards the middle, avoiding the lower oven rack placement. Line 2 muffin baking sheets with 15 muffin paper liners. Set aside. 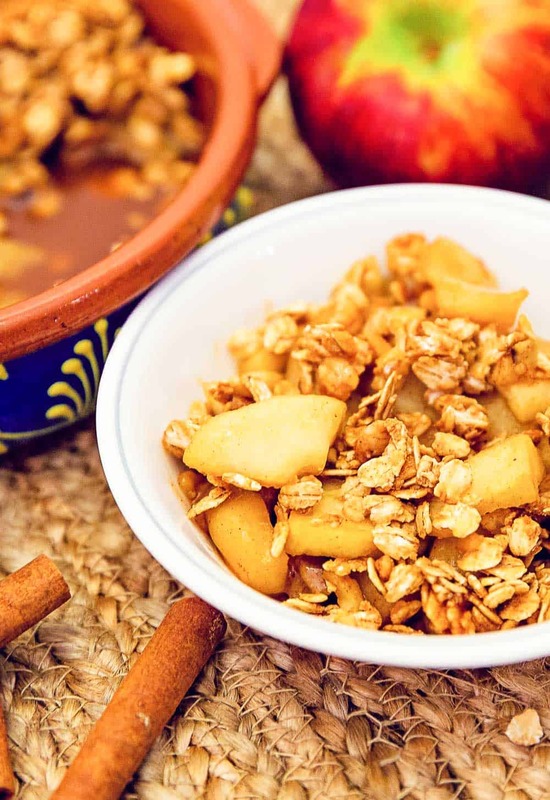 Place all the ingredients except the raisins and walnuts into a large mixing bowl. Stir until well combined, then add the raisins and walnuts. Stir again to combine. Fill the muffin baking sheets (with paper liners) almost to the top of the muffin liner sides. The batter will rise slightly so do not overfill. Place the muffin baking sheets into a preheated 350 F oven and bake for 26 to 28 minutes or until a toothpick comes out clean. It is OK if there are a few crumbs on the toothpick, but it should not be gooey. Note, if both muffin sheets do not fit onto one center oven rack, then rotate the muffin sheets from bottom to top racks and vice-versa half-way through. 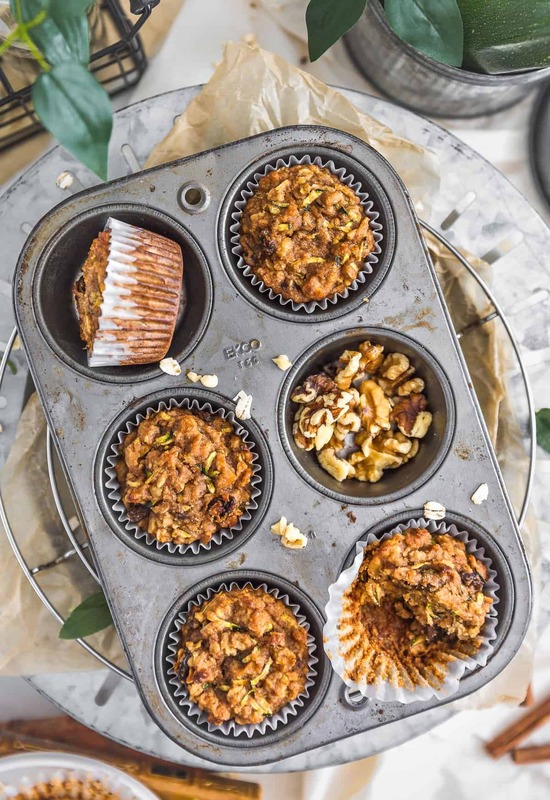 Once out of the oven, allow to cool for 5 minutes, then transfer the muffins from the muffin baking sheet to a wire rack to cool for 10 minutes. Allowing the muffins to rest for 10 minutes allows them to firm up in texture. *Grating Zucchini: If using large zucchinis, cut the zucchini into fourths lengthwise and remove the whitish pith and seeds before grating. This will create a better muffin batter. When grating, use a medium grate, not fine grate. Leave the zucchini skins on. If the zucchini is extra watery, place the grated zucchini in a clean dish towel and wring out the water. *Storage: Use within one week, no refrigeration is required. Freezes well. Storage: Use within one week, no refrigeration is required. Freezes well. Yes, we love Bob’s Red Mill 1-to-1 Baking Flour and their Gluten Free Flour. We use them both regularly. Gluten Free baking is a delicate balance, we haven’t tried this recipe using either of the flours. We’d love to hear how it went. Do you think you could use regular white flour instead of the almond and brown rice flours? It is all that I have on hand. As we are gluten free, we have not test this recipe with flour. 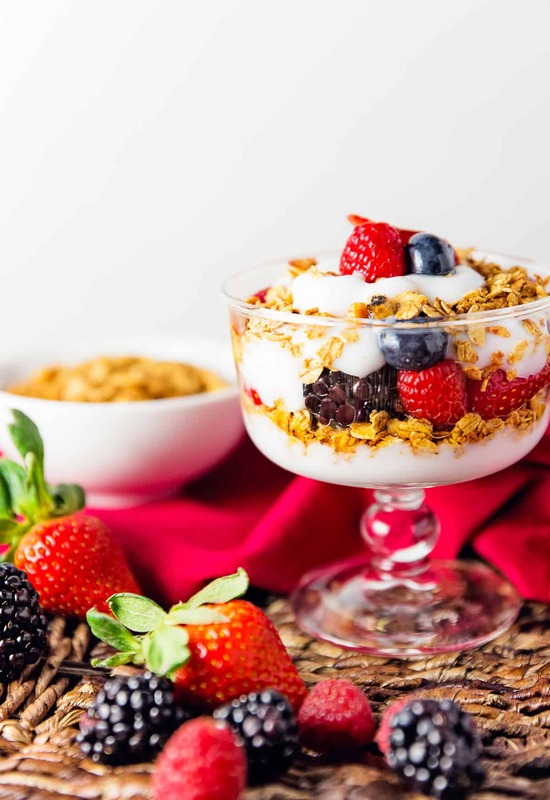 Gluten free flours like almond and brown rice absorb liquid differently than flour. So we aren’t sure how well the recipe would work with subbing the ingredients with flour. You may need to play around with the ingredients to get a nice batter consistency. If you try it, we’d love to hear how it goes. Don’t bury the old grater. Mount it on a plaque and add to kitchen decor! It is now both history and art. Hee hee, yes, it is history <3 We'll definitely be keeping this vintage treasure. 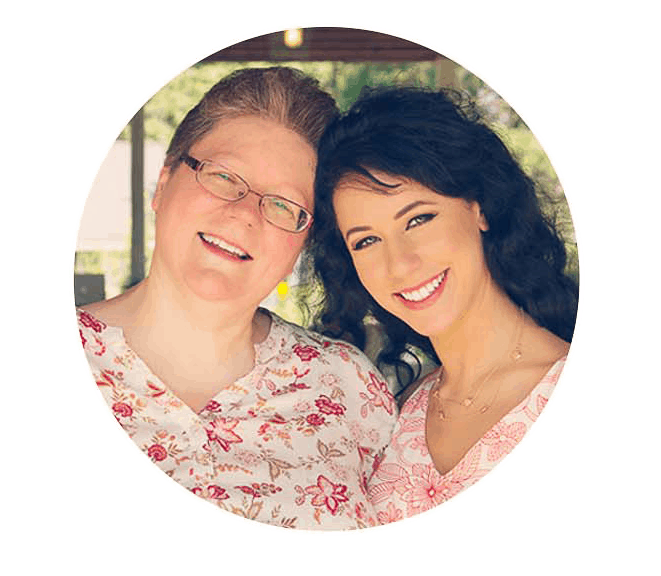 Hi my daughter is allergic to almonds (and other nuts except pecans) as well as wheat, and so many gluten free recipes include almond flour! Any ideas on what I can replace it with? Thank you so much for reaching out to us. 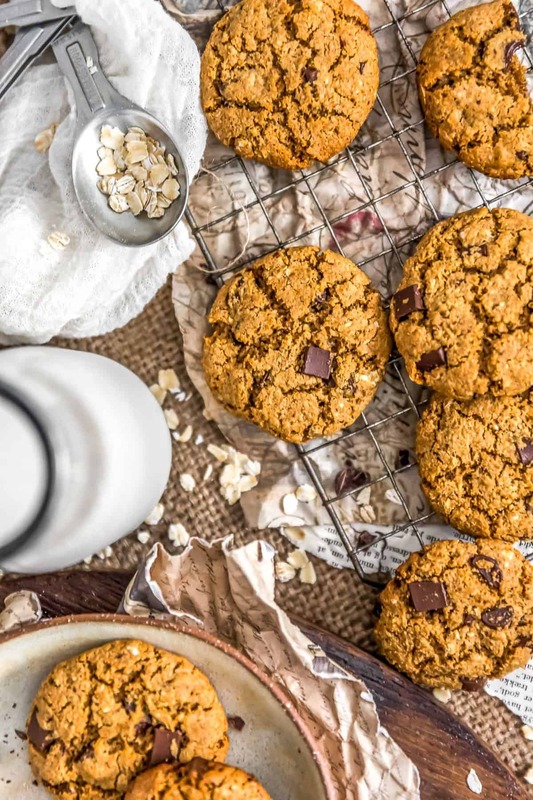 This recipe was created for almond flour. You could try replacing it with a gluten free flour, but we cannot guarantee that it will come out or will taste right.